After last Monday’s Tether induced price spike, XBT reverted to the range bound trading we have become accustomed to. XBT closed for the week flat at AU$9,020, within the AU$8,900 – AU$9,100 range we have seen for the past few weeks. The most notable move was the 45% ZRX rally on Tuesday/Wednesday which happened after Coinbase listed the token. Tether/Bitfinex rumours continued to swirl after last week’s temporary USDT unpegging. Despite the USD/USDT spread closing, Bitfinex crypto pairs are still trading at a premium as traders harbour concerns of how robust Bitfinex’s banking relationships are. For traders happy to take the risk, there was at one point a US$200 arb to be had between our IR orderbook and Bitfinex XBT/USD pair. Despite there being more than enough functioning stable coins in the market, Tether still dominates, enjoying an 98% share of the total stable coins traded on Binance. Despite the troubles Tether faces, it still enjoys the benefit of early establishment and most listed tradable pairs. A full suite of new stable coins has recently been regulated by the New York Department of Financial Services (NYDFS). All have appointed auditors to give investors transparency and comfort in what is actually backing the stable coin. Despite Cameron Winklevoss’s GUSD being one of those stable coins under audit, Winklevoss voiced frustration at the challenge of obtaining an audit and the ineffectiveness of using traditional auditing methods on a crypto product. I can safely say that we at IR share some of Winklevoss’s frustration. It has taken us over 5 years to convince a top tier financial auditor to delve into this space and appoint an audit of our exchange. 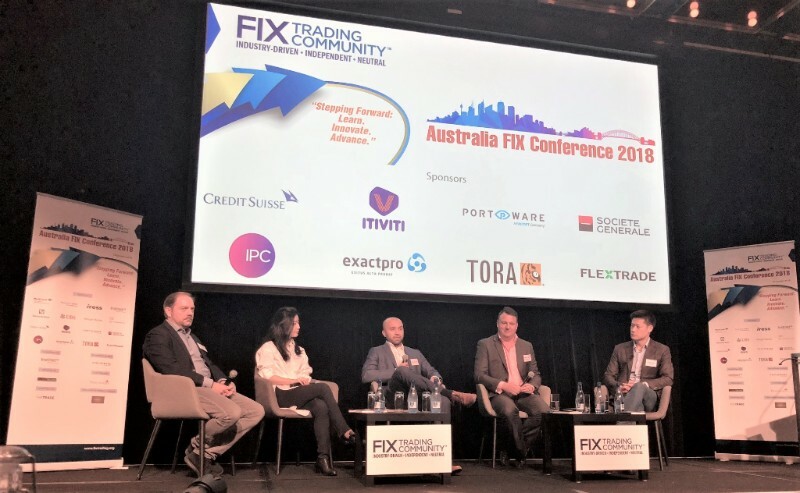 Last Thursday I had the pleasure of attending the Sydney FIX Trading Community Conference. The event addressed issues facing buy/sell-side institutions, exchange trading and regulatory impact on the trading realm. It covered some interesting topics, such as AI and data analytical trading. It also covered some necessary, albeit dry-as-Weet-bix-no-milk topics such as MiFID II regulatory Implications. It was impressive to see two out of the nine sessions for the day dedicated to crypto and their integration into institutional order flow. Our CEO, Adrian Przelozny sat on a crypto panel discussing the journey of crypto regulation in Australia, digital asset storage, and the shift from an early adopter retail client base to a more sophisticated financial investor type client base. In ICO news ASIC strikes again as Global Tech, a 5 month old ICO backed by former Australian cricket captain Michael Clarke, is shut down. The ICO looked to raise AU$50million but has now officially deregistered and ceased in accordance with ASIC requirements. ASIC has been somewhat vocal in the media as of late, delivering the message that it will continue to monitor ICOs and make sure they adhere to normal capital raising obligations set by ASIC. Happy to see someone policing these sh!tcoins. In a far more positive note, Australian Blockchain company Power Ledger was named the winner of Sir Richard Branson’s Necker Island Extreme Tech Challenge. The Power Ledger team beat three leading edge tech finalists to win access to Branson’s extensive network, mentoring, infrastructure support and endorsements from Branson himself. Well done guys!